Online gaming, whether it be for fun as a hobby or earning extra income through gambling, the fun and options are endless. Online gambling has become one of the most popular and trendiest hobbies to individuals around the world. With the significant shift to online casinos, slot machines and other forms of online gambling, individuals are consistently in searcg of the best websites and applications that fulfill their desires. As the search ensues, one of the most sought after applications to surface is the Leo Vegas mobile app. The Leo Vegas mobile app is a mobile telephone application that can be downloaded and utilized in gambling. This application has been raved about by many as one of the best and even called a “shooting star” by a hard to please application online reviewer. The application is available to download on just about every mobile platform and includes massive bonuses that are attractive to the players. The game hails from Scandinavia and the main focus is the mobile and smartphone market. From the insane benefits and bonuses to various properties of the game, fan and players adknowledge unexpected excitement in relation to the Leo Vegas application. One of the newer applications on the market is taking the market by storm as it has even been described as a “shooting star” by an avid gamer review site. Now popular for its generosity in free spin offers, the Leo Vegas application can be enjoyed on just about any android platform. The application has taken the online gambling world by storm and has been called the best gambling application currently on the market. The application’s bonuses include 200% bonuses for UK players, 150% first deposit bonus for other countries, 20 free spins without a deposit, a casino that is fully mobile, and the latest of Net Entertainment’s touch slots. The plethora of incentives to new and existing players is endless with generous amounts of chances to succeed with gains and wins. The Leo Vegas application includes various games from vendors that range from Net Entertainment, NYX interactive, Microgaming and many more. This application presents the best games by 9 of the most unbeaten software companies on the market. Leo Vegas focuses heavily and is geared towards the online gambler that seeks the ability to conveniently carry the game along and play on the go. Gamers have about 400 games, with approximately 360 slot machines and a significant amount of exclusive games, available online and on the application. Leo Vegas offers very quick payments at only 12 hours and weekly transaction limits that can be increased with high roller accounts. Leo Vegas already presents gamers with a top notch gaming experience and a significant variety of games to be enjoyed anywhere. The Leo Vegas application is an application that has conducted proper research in compiling some of the best games to enhance the enjoyment of online gamblers. The application is available on just about every platform, which contributed to their receipt of gaming awards in 2013 and 2014 for quality of service. An account can be registered online or on the application by simply receiving a code via email to complete registration. 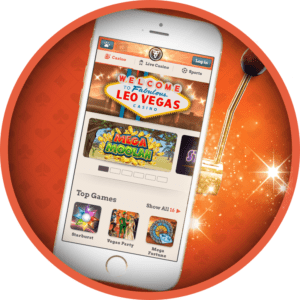 Leo Vegas holds licenses in the UK and Malta, which offers the liberty to access in various locations and is operated by LeoVegas Gaming Ltd. As undoubtedly the best application on the market, it is no surprise why gamers flock to the application in large numbers. If you haven’t already, there’s no better time than now to get in on the action and start experiencing the best in gaming.